Download "IMPORTANT INFORMATION ABOUT OPTIONAL PRACTICAL TRAINING WHAT YOU NEED TO KNOW ABOUT F-1 OPTIONAL PRACTICAL TRAINING EMPLOYMENT AUTHORIZATION:"
1 IMPORTANT INFORMATION ABOUT OPTIONAL PRACTICAL TRAINING If you would like to get work experience in your major field of study this summer or after you complete your studies this spring, you should apply for Optional Practical Training employment authorization from U.S. Citizenship and Immigration Services (USCIS) early! 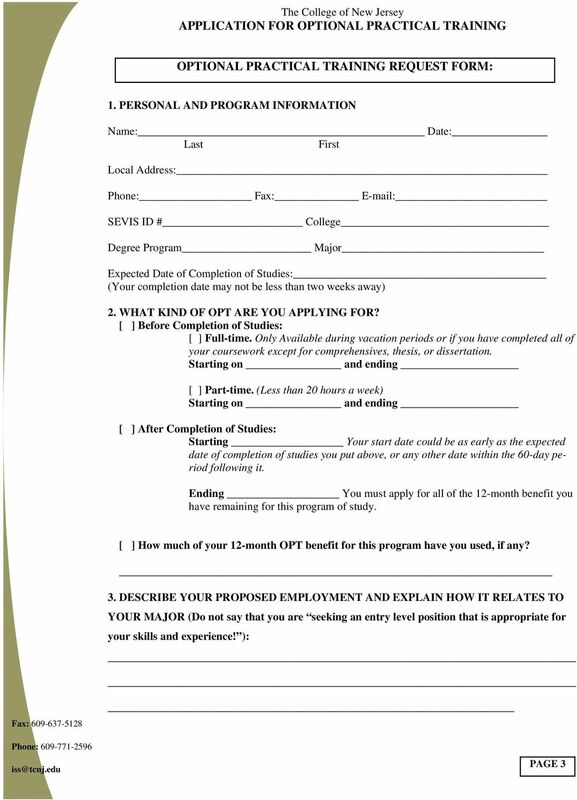 YOU DO NOT HAVE TO HAVE A JOB OFFER TO APPLY FOR OPT! AFTER-COMPLETION OF STUDIES OPT BY LAW, YOU MUST APPLY FOR AFTER-COMPLETION OF STUDIES OPT BEFORE YOU COMPLETE YOUR PROGRAM OF STUDY! If you have travel plans after school ends, your OPT must be authorized by USCIS BEFORE you leave the country. We are unable to endorse your Form I-20 for reentry until your EAD card is issued. You will need your EAD Card, endorsed I-20 and a letter from an employer to return to the U.S. Apply for OPT now if you want to travel or start working soon after the semester ends. USCIS may take two months to process your OPT application during heavy application periods. WHAT YOU NEED TO KNOW ABOUT F-1 OPTIONAL PRACTICAL TRAINING EMPLOYMENT AUTHORIZATION: WHAT IS IT? 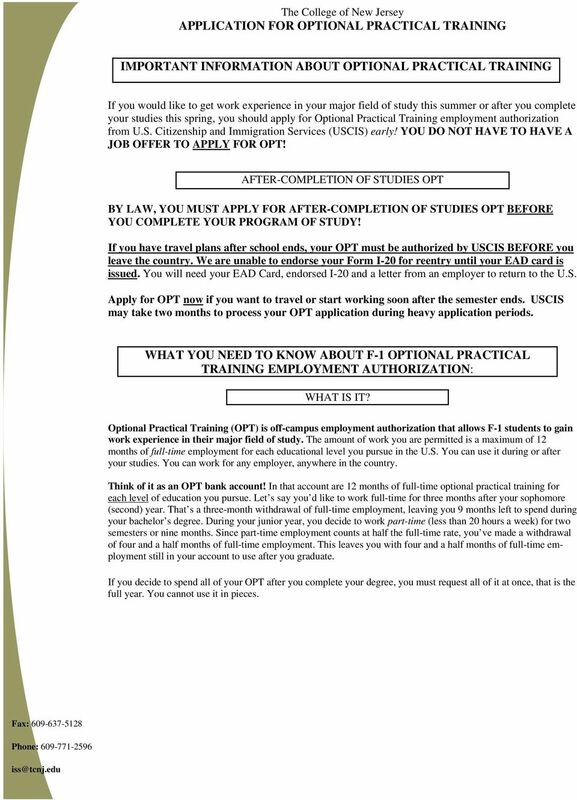 Optional Practical Training (OPT) is off-campus employment authorization that allows F-1 students to gain work experience in their major field of study. The amount of work you are permitted is a maximum of 12 months of full-time employment for each educational level you pursue in the U.S. You can use it during or after your studies. You can work for any employer, anywhere in the country. Think of it as an OPT bank account! In that account are 12 months of full-time optional practical training for each level of education you pursue. Let s say you d like to work full-time for three months after your sophomore (second) year. That s a three-month withdrawal of full-time employment, leaving you 9 months left to spend during your bachelor s degree. During your junior year, you decide to work part-time (less than 20 hours a week) for two semesters or nine months. Since part-time employment counts at half the full-time rate, you ve made a withdrawal of four and a half months of full-time employment. This leaves you with four and a half months of full-time employment still in your account to use after you graduate. If you decide to spend all of your OPT after you complete your degree, you must request all of it at once, that is the full year. You cannot use it in pieces. 2 HOW CAN IT BE USED? While school is in session part-time employment only After completion of all course requirements for a bachelor s, master s or doctoral degree, excluding the thesis or equivalent part or full-time employment After completion of ALL requirements for the course of study full-time employment only HOW CAN YOU QUALIFY FOR IT? 1. You must have been enrolled full-time for at least one academic year. 2. You must be able to describe how the type of work you are seeking directly relates to your major. 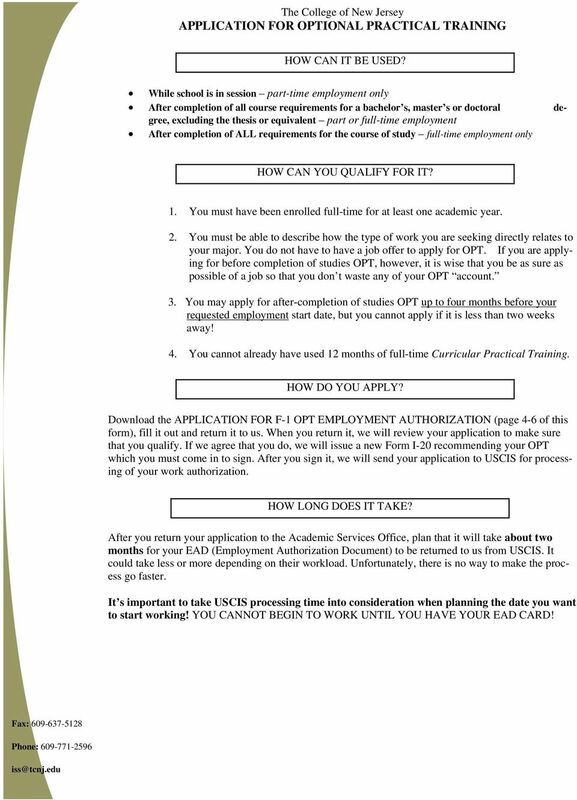 You do not have to have a job offer to apply for OPT. If you are applying for before completion of studies OPT, however, it is wise that you be as sure as possible of a job so that you don t waste any of your OPT account. 3. You may apply for after-completion of studies OPT up to four months before your requested employment start date, but you cannot apply if it is less than two weeks away! 4. You cannot already have used 12 months of full-time Curricular Practical Training. HOW DO YOU APPLY? 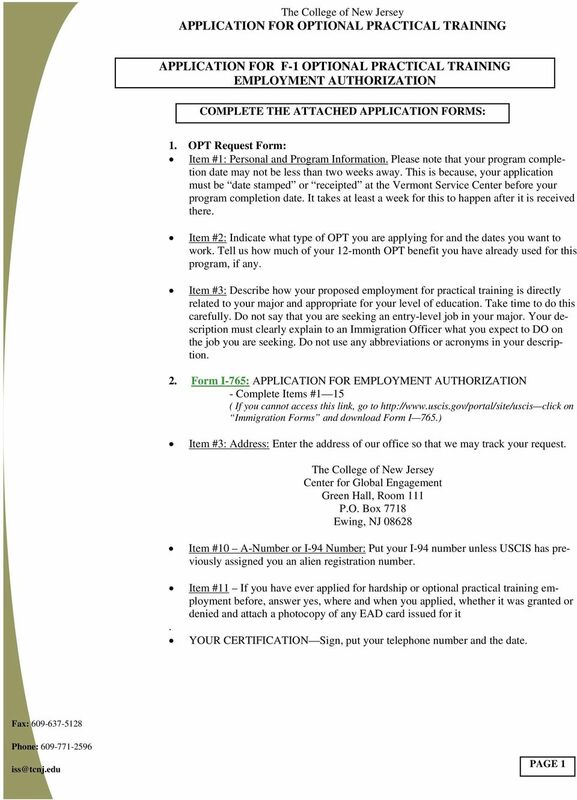 Download the APPLICATION FOR F-1 OPT EMPLOYMENT AUTHORIZATION (page 4-6 of this form), fill it out and return it to us. When you return it, we will review your application to make sure that you qualify. If we agree that you do, we will issue a new Form I-20 recommending your OPT which you must come in to sign. After you sign it, we will send your application to USCIS for processing of your work authorization. HOW LONG DOES IT TAKE? After you return your application to the Academic Services Office, plan that it will take about two months for your EAD (Employment Authorization Document) to be returned to us from USCIS. It could take less or more depending on their workload. Unfortunately, there is no way to make the process go faster. It s important to take USCIS processing time into consideration when planning the date you want to start working! YOU CANNOT BEGIN TO WORK UNTIL YOU HAVE YOUR EAD CARD! 3 WHAT IF I WANT TO TRAVEL BEFORE STARTING AFTER/ COMPLETION OF STUDIES OPT? Contact the Center for Global Engagement before making any travel plans if your OPT is still pending USCIS authorization. You are required to have your employment authorized and a job to which you are returning. HOW CAN I EXTEND MY OPT? You can extend Before-completion of studies by filing another application. You may not continue to work until it has been authorized by USCIS. After-completion OPT cannot be extended. You must apply for the full amount of time remaining in your 12-month bank account. You will, however, be entitled to another 12-month period of OPT if you go on to a higher level of study. WHAT HAPPENS AFTER THE COMPLETION OF MY OPT? Immigration regulations state that, Authorization to engage in optional practical training employment is automatically terminated when the student transfers to another school or beings student at another educational level. 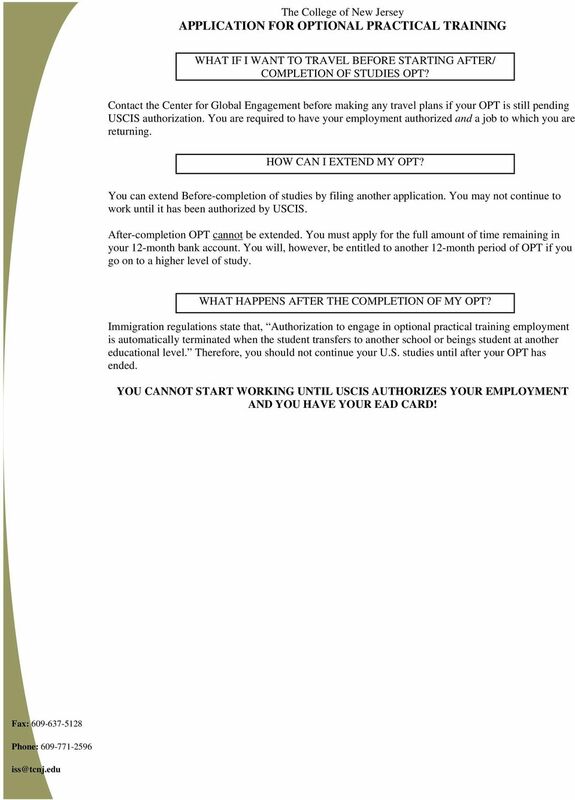 Therefore, you should not continue your U.S. studies until after your OPT has ended. 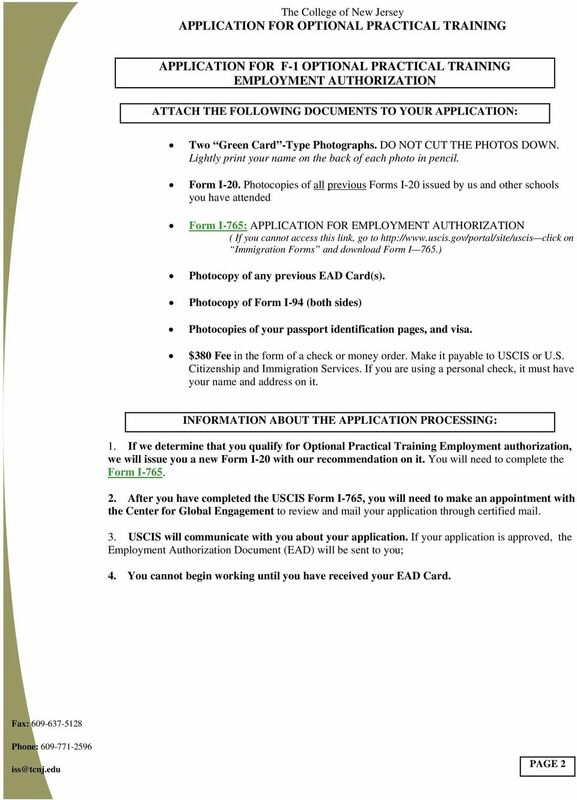 YOU CANNOT START WORKING UNTIL USCIS AUTHORIZES YOUR EMPLOYMENT AND YOU HAVE YOUR EAD CARD!